Gym Molly uses the most effective form of vitamin B12 (methylcobalamin) in the world. Providing your brain with pure energy and a boost in clarity. Acetyl L-Carnitine HCI is an Amino Acid that is naturally created in the body and significantly benefits brain function. Acetyl L-Carnitine HCI supports circulation in the brain and enhances memory, cognition, and alertness. Acetyl L-Carnitine HCI is an Amino Acid that is naturally created in the body and supports energy production. Acetyl L-Carnitine HCI converts fat into energy, when exercising and resting. Acetyl L-Carnitine HCI is the most powerful form of L-Carnitine and acts as an antioxidant. Acetyl L-Carnitine HCI significantly benefits brain function - enhancing memory, cognition, and alertness. Betaine is a naturally occurring compound, originally derived from sugar beets. Betaine Anhydrous enhances strength, muscle growth, endurance and sprinting performance. University of Connecticut researchers found, that Betaine can increase muscle strength by up to 25%. Gym Molly utilizes Instaminos™ not only to accelerate the body’s recovery but also to maximize its potential during exercise. Instaminos™ are a customized blend of three essential Amino acids (Leucine, Isoleucine, and Valine) that stimulate protein synthesis. Instaminos™ have been proven to improve exercise performance by reducing the body’s susceptibility to fatigue, muscle damage, and loss of energy. 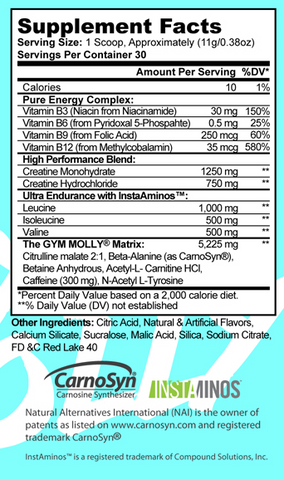 Gym Molly uses the highest grade N-Acetyl-L-Tyrosine with accelerated absorption that can boost your memory. NALT helps memory formation, learning capacity, general responsiveness and analytical skills. NALT also promotes a positive mental outlook via its mood booster. Caffeine is the one of the most effective ways to increase alertness, sharpen focus, boost pain tolerance, burn fat and increase workout duration. Caffeine has been proven to improve the performance of sprinters and endurance athletes. Creatine naturally exists in the body and Gym Molly has the best kind with the faster absorption rate. Gym Molly uses the highest grade Creatine HCL, that is 40 times more soluble than ordinary Creatine. Creatine HCL increases muscle strength/size, enhances recovery, improves burst performance, and improves brain function. CarnoSyn® (beta-alanine) is a naturally occurring amino acid that dramatically improves athletic performance. CarnoSyn® is proven to significantly delay muscle fatigue, increases exercise endurance, and peak capacity across a wide span of athletic competitions.